Some fantastic friends sent us home with homemade jam last week. That oily fingerprint on the kumquat & strawberry label? It’s mine, not theirs. I know this because it matches the one on my keyboard. Lest you worry about the sanitation of homemade jam. So I’ve been devouring the strawberry kumquat which is the perfect sweet, not too, with a little sour and the occasional jelly soft kumquat rind surprise. I love it. It got me thinking. How do you like your jam? Can’t go wrong with good bread and butter. 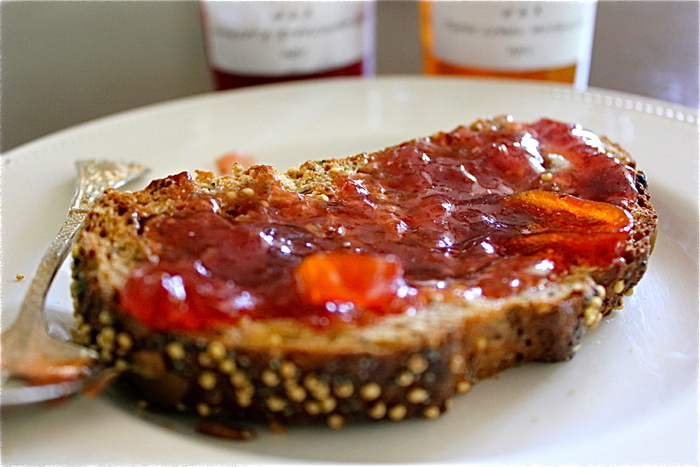 But I like jam best when paired with something savory, like in an open-faced grilled cheese. This time last year, Lydia and I prepared a baguette sandwich with grilled pork tenderloin and strawberry chutney, which I think is among our very best recipes. 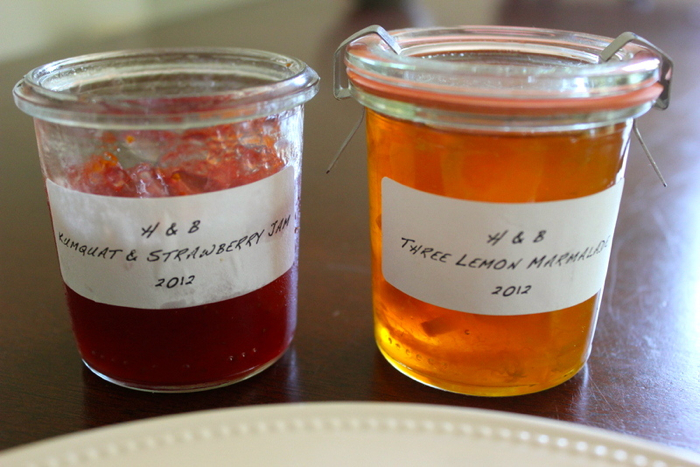 My favorite, though, is strawberry jam or cranberry sauce (fruit + sugar+ citrus = jam!) on one slice of multigrain bread, Grey poupon on the other and a nice stack of roasted turkey breast, havarti cheese and watercress in the middle. That’s my mom’s special order and my sister and I think it’s the you-know-what. So, tell me please, how do like your jam? Have a happy, happy Memorial Day weekend, my loves. We’ll see you Tuesday.